WBSC co-President Fraccari: “The global spread and strength of the countries participating in this Youth Under-15 Baseball World Cup will create a unique atmosphere and generate great excitement for the athletes." 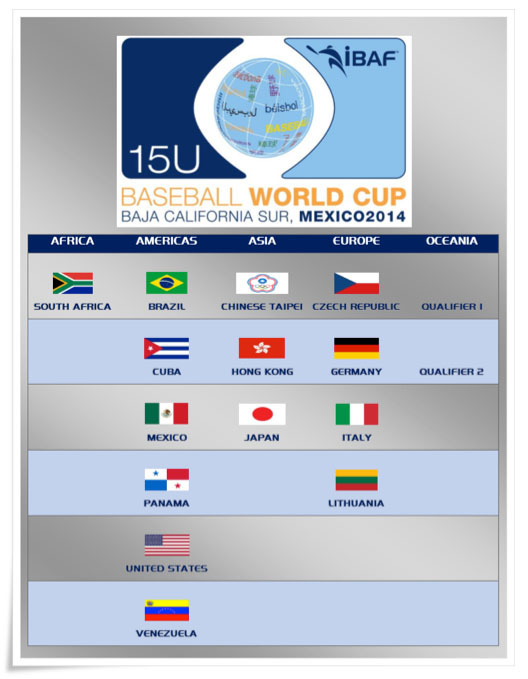 LAUSANNE (SUI) – WBSC’s International Baseball executive board has revealed fourteen of the sixteen countries that will assemble National Teams and participate in the 2nd Under-15 Baseball World Cup this August in Baja California Sur, Mexico. Oceania has been assigned two participating National Teams in the U-15 Baseball World Cup, and the Oceania representatives will be known following the 3-6 April U-15 Oceania Championship between Australia, Guam and host New Zealand. Of the fourteen nations that have already qualified, six will come from the Americas: Brazil, Cuba (2012 U-15 silver), Mexico, Panama, United States and defending U-15 World Champion Venezuela. Europe will have four representatives: Czech Republic, Italy, Germany and Lithuania. Asia will be represented by Chinese Taipei (2012 U-15 bronze), Hong Kong and Japan – while Africa will be represented by South Africa. The U-15 youth baseball world championship was launched in 2012; and for the first time in its young history, its spread will span the globe, covering Africa, the Americas (including the Caribbean, North-, Central and South America), Asia, Europe and Oceania – not since the 2009 Men’s Baseball World Cup has a baseball world championship had such universal representation. For Africa and Oceania, it will be the first time either continent has ever been represented in the U-15 Baseball World Cup; seven countries will be first-time participants in this new youth-centered category – Czech Republic, Japan, Panama, South Africa, the United States and the two representatives from Oceania. WBSC co-president Riccardo Fraccari hailed the work of the National Federations and the growing competitiveness, attraction and universality of the U-15 Baseball World Cup. “The global spread and strength of the countries participating in this Youth Under-15 Baseball World Cup will create a unique atmosphere and generate great excitement for the athletes, as they come from all around the world to share and shine on the same world stage,” Fraccari said. “The composition of this youth championship highlights the excellent work and determination of the National Federations, who are being resourceful and innovative in building and advancing baseball in their countries around the world – and in attracting young talented athletes to our sport,” Fraccari added. Fraccari also expressed his satisfaction with baseball’s stronghold and positioning in the youth sport market.